I’m very excited about Halloween! Trick or treating doesn’t exist in Japan for the most part. I live on a military base in Yokohama, and the local children are allowed to come on base to trick or treat! Last year, it was very entertaining to see all the costumes. Since Halloween is one of my favorite Holidays, I’m so glad to see it’s popularity growing each year in Japan. I wish i had more parties when i was child and in my school days. To me it seems there are many events in the states…like big birthday party, Chiristmas, thanksgiving, Prom, Homecoming?, warming party, Wedding shower, Baby shower, etc. Then people dress up boldly, various decorations! American know how to have fun more than Japanese. But i just wanna say I love my country!! I really love to read this blog and a girl who writing this. Because i can see how forigners feel about Japan. and i can find Good points. i used to dream to go overseas, especially America. I never tried to like here and i didnt know how nice here is untill I met her who loves Japan! Back to the subject, Im also glad to see Halloween is popularity growing in Japan. Im so excited about my Frist Halloween party this weekend! Thank you for your comment! I am so glad that you are enjoying my blog. =) I’m also excited that you’ll get to celebrate Halloween with us. I guess Americans come up with all sorts of reasons to have parties, haha. Maybe there won’t even be a reason! Just to get together with friends and have a good time. I’m extremely late, but that’s a pretty hot costume. Since you only showed a bit, I don’t feel too bad asking what you were supposed to be. 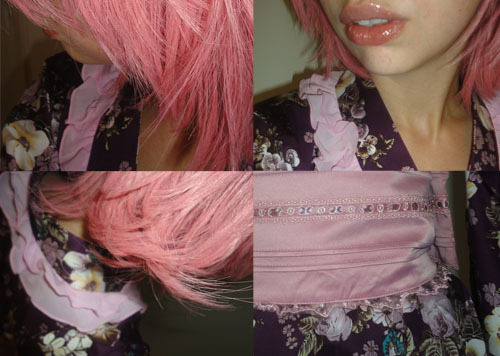 Pink hair usually means anime character, but I can’t quite figure it out. On an entirely different note, we’ve started inviting guests on the show via Skype on a fairly regular basis and would love to have you on at some point in the future if you don’t mind hanging out with the Bad Communication boys for an hour or so. You seem like the kind of girl who can more than hold her own around a couple of social pariahs. Let me know if you’d be interested! PS – How was karaoke last night? I saw on twitter that you were going out.